Too bad that this photo is so dull because this card turned out so sweet and my customers loved doing this card using the babywipe technique and Stampin Up reinkers. To do the babywipe technique, you need a babywipe folded in 1/2 and then in 1/2 again to create a “pad”. Add 3-5 colors of reinker (about 6 or so drops) of each color from dark to light and then take stamp and stamp it on the prepared babywipe. Make sure all the whole image has color and then stamp on plain cardstock. 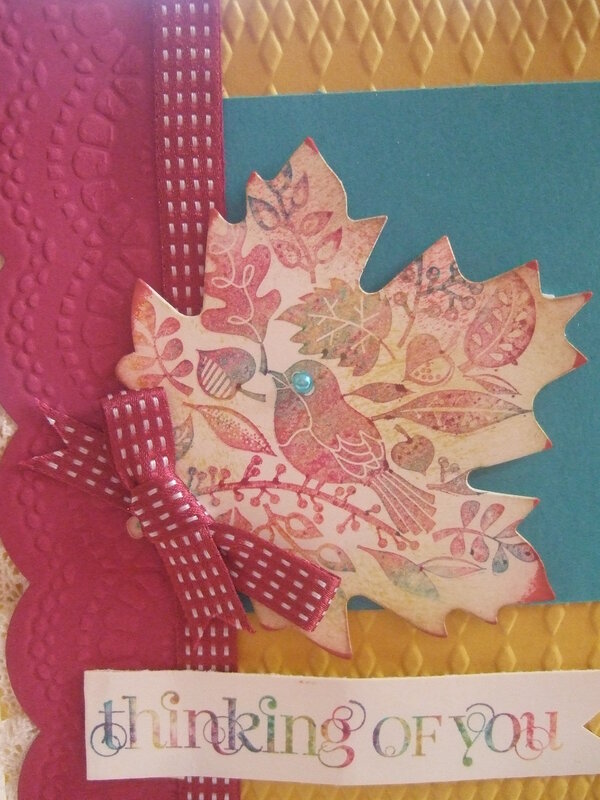 I used very vanilla cardstock and the Tweet Leaves #128111 and the coordinating Autumn Accents Die #127812. The Raspberry Ripple scalloped edge was textured using the Delicate Designs folder #127023 and then cut with the Stampin Up companion product- the large Scallop Edgelits #127019 and then finished with the raspberry ripple 3/8 ” stitched ribbon #126845. The babywipe technique creates a watercolor look and each card looks just a bit different. Give it a try and send me your card via email and I will post it to the blog.